Spoiler Alert! If you have any intention of watching this movie without knowing how it ends beforehand, be forewarned. There is absolutely no way to discuss it and it's inspirational impact without revealing the ending, since it is based on a true story. Go watch the movie, then come back and read this review. 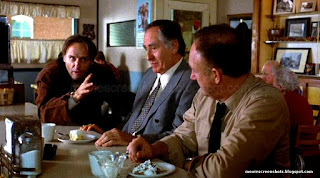 Before the actual review, a personal reminiscence: I grew up in a small town in north Texas, probably roughly the same size as this fictional town presented in the movie. One of the scenes that stands out for me is the caravan of people from the town heading out to an away game for the Hickory Huskers. This is (or was) pretty true to life in my hometown. Often the whole town would roll up the sidewalks and head out to follow the team, especially if we were in the playoffs. And my high school basketball team won state in 1972 (they were 1-A back then, but now are big enough to be 3-A). As I will clarify later, most states have rankings that delineate according to enrollment. In 1972 the population of my hometown was only a little of 700, and the whole school from 1st grade to 12th grade probably had less than 250 kids. There is something about the little guy taking down a big guy that leads to real inspiration. Think of the classic Biblical story of David taking down the giant Goliath. Whenever an undersized and weaker opponent takes on a behemoth, you can't help but stand up and cheer. Hoosiers is a film based on a true story of just about those same ideas. Up until 1997, Indiana had a one state wide school championship for athletics. (By contrast, in Texas there are currently 10 separate divisions, delineated by the enrollment size of each school.) But in Indiana, for years, it was just one winner-take-all title. This meant that many teams could advance in the tournament, but usually fell to larger schools later in the rounds. The story of the rise of the Milan Indians is encapsulated in the movie. 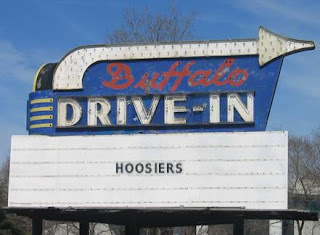 The Milan Indians of 1953/54, a small school, went on to win the state championship in high school basketball that year, although, to be fair, the movie takes a lot of liberties with the true story in the interest of capturing the audience's fascination. 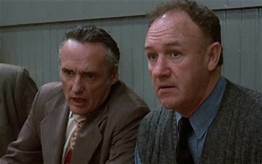 For instance, while the movie captures some of the essence of the newly hired head coach (played by Gene Hackman), the actual coach of the Milan team had been on hand for two seasons prior to the championship season. And, although the Hickory Huskers succeed in their efforts with a bare minimum of players, the Milan team actually had 12 players on the team. Still, the essence is there, and you may or may not be disappointed with it's lapses in being true to the facts, but you won't be able to argue that it's not an inspiring movie. Two: Gene Hackman confided with Dennis Hopper that he thought this movie would ruin their respective careers. He couldn't be more wrong. 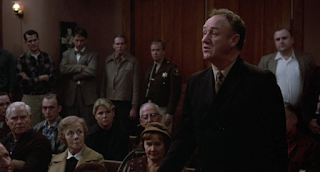 Hopper was nominated for an Oscar and Hackman became a bigger name himself in Hollywood directly as a result of this movie. 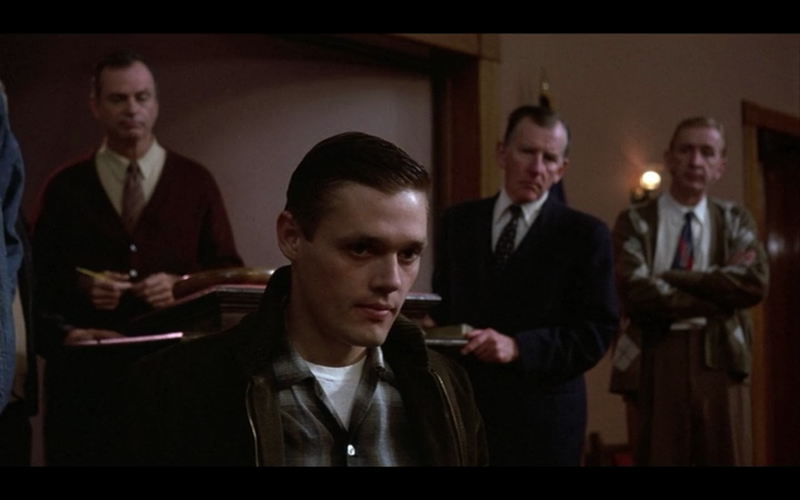 The actor who played star player Jimmy Chitwood (Maris Valainis) was actually cut by his high school team several times, yet in the movie, the scenes where he is shown shooting and making shots were nearly all done in one take. In other words, the actor was a pretty damn good shooter, despite his travails at being on the team. Dale gets off to another rocky start at his first practice. He reprimands one player for not paying attention, which causes the player to leave the practice in disgust, taking his best friend with him, and leaving Dale with the bare minimum of a squad. 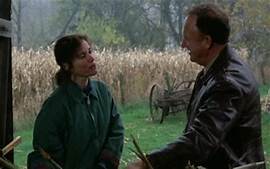 He also manages to alienate many of the town's menfolk who are used to being able to watch the team practice, and especially George (Chelcie Ross) who had been coaching the team after the death of the old coach. Rollin (Robert Swan) approaches the coach with his recalcitrant son in tow to have Dale reinstate the son on the team, and in the process makes all he menfolk leave dale alone to his coaching duties. Early on, Dale's coaching scheme is somewhat confusing and seemingly outre to the townsfolk, coupled with the fact that the team loses the first few games in the season. The town is almost apoplectic, since basketball is almost like a second religion in the state. (Much like football is here in Texas...) In the meantime, Myra has discovered Dale's true past (referenced above). 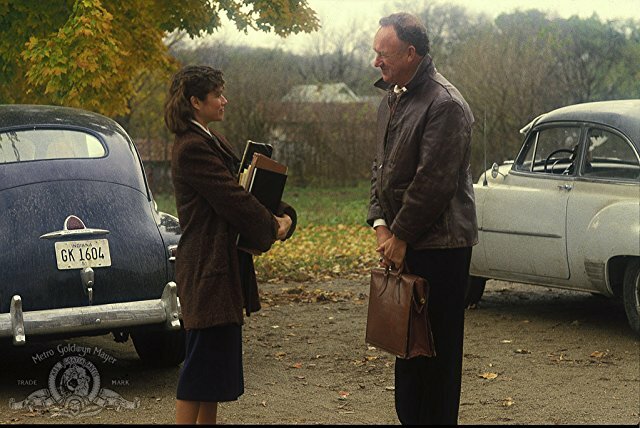 When the town decides to call a referendum to vote on Dale's future as a head coach in the school, she tells Dale of her intent to reveal what she has learned at the meeting. That night at the meeting however, she declines to be forthright in her intention and instead urges those present to give Dale a chance. 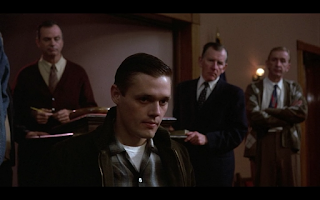 Jimmy Chitwood, who has been observing the coach, comes forward just after the secret ballot has been cast, but while it is still being counted, that he wants to rejoin the team, but only if Dale is going to be the coach. However, the townsfolk have already decided to dismiss Dale. But an immediate re-vote is called after Jimmy's revelation and Dale is, of course, kept on as coach. 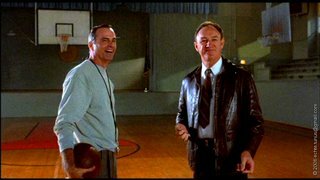 With "Shooter" Flack (Dennis Hopper), alcoholic father of one of the boys, and with the addition of Jimmy in the lineup, the town's team goes on a winning streak that could only happen in Hollywood (or in the dreamland of 50's Indiana...). They continue to win and eventually advance into the playoffs. 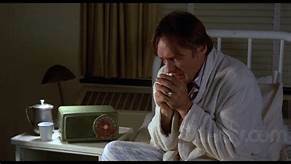 In reference to Shooter, he is a hard-bitten alcoholic, and, although he tries hard to stay sober for the good of the team and his new-found usefulness, he doesn't succeed throughout the movie. In this movie, Dennis Hopper pulls off a very well earned nomination for Best Supporting Actor (which he lost to Michael Caine). Hopper had a special care for the role as he was in recovery himself. 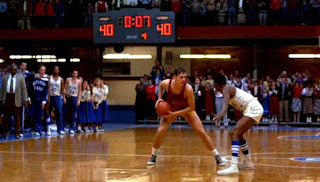 In fact, the original script had Shooter skipping out of the rehab center where he was sent in order to watch the game in person, but Hopper insisted that that would be wrong for the character. Despite the writers' (and director's) objection to the change, they filmed it as Hopper thought it should be, with Shooter remaining at the rehab and just listening to the game on the radio. And that proved to be the better solution after all. The basketball games scenes are the most adrenaline pumping scenes of the movie. 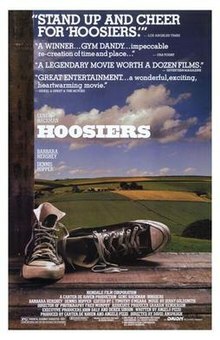 I've watched this movie a dozen times or more and I was amazed when I learned that only about 6 minutes of film time involve actual scenes on the court. 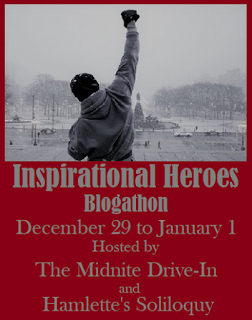 Yet, especially with the scenes taking place in the finals game, the rousing inspiration which caused me to add this movie to the blogathon is really evident. True to fact, the small town Hickory team does indeed appear small against the giant from South Bend Central. And true to fact, the final result depends on the final shot coming as a buzzer beater to win the game. 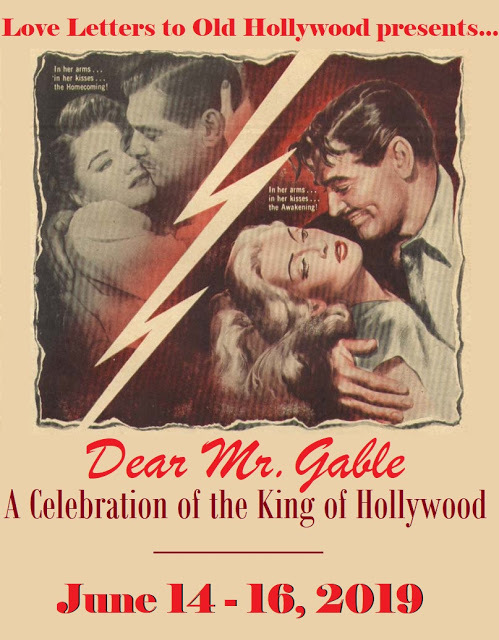 You can't help but be drawn into the characters in this movie, the only downside in my opinion was the director's need to create some sort of May-December relationship between Dale and Myra. Was it really necessary? 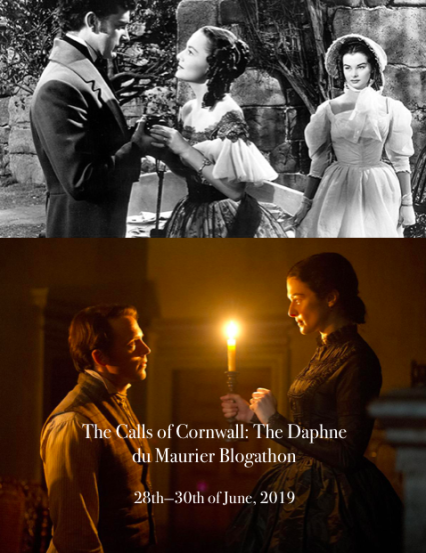 Maybe in terms of drawing a female audience into the picture, but in my opinion the two could have developed a handshaking acquaintance and it would not have detracted from the emotional impact of the two changing from a somewhat hostile relationship to one of a more friendly nature. More so than any other movie I have seen, this is one that really gives one an incentive to stand up and cheer at the end of the movie. 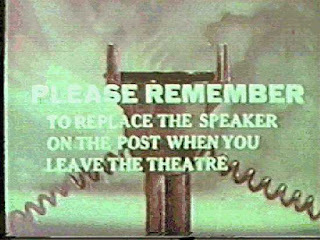 And there is something that is sorely missing these days. 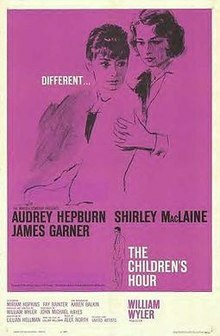 I understand it was not uncommon back as late as the 50's and maybe even 60's for theater audiences to actually stand and applaud films like this, despite the fact that the actors were not present to receive the accolades. So ring in the new year with a new faith in the common man to overcome the odds and prevail by watching this one, and perhaps even you too may stand and cheer at the end. Yes. There are few things as inspirational as the hard work it takes for the little guy to overcome the odds and beat the big guy. I haven't seen this movie since it was first released in theatres. I think it is time to catch up with what made it so popular. If nothing else it's worth a view just to see the little guy defeat the giant. Thanks for reading. This is one I have to put on my list, have never seen it, but I love Gene Hackman and Barbara Hershey so looking forward to finally seeing it thanks to your inspiring post! Someday you and I have to get together and watch a few movies (ones that one of us adores but the other hasn't seen). 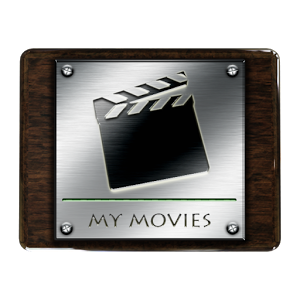 there are so many movies you like that i haven't seen and vice versa. Thanks for reading. I can't believe Gene Hackman thought this movie would ruin his career. Like you said, he could not be more wrong. I avoided this film for years because I thought it was a typical sports film – insert eye rolling – with all the usual stereotypes. I couldn't be more wrong, either. I thought this film had an unusual depth and it's a bit gritty-looking which makes it all the more inspirational. Well, sports films attract me more than others, but I'm a typical guy after all.. Thanks for reading.